After a 24-year hiatus I returned to school in the 80’s, this time to finally earn a degree. A crippling back injury had just ended 20 years of construction, and thus my general contractor’s license, my plumber/gasfitter’s license, my residential electrical certifications; all that was gone thanks to a cast-iron bathtub. 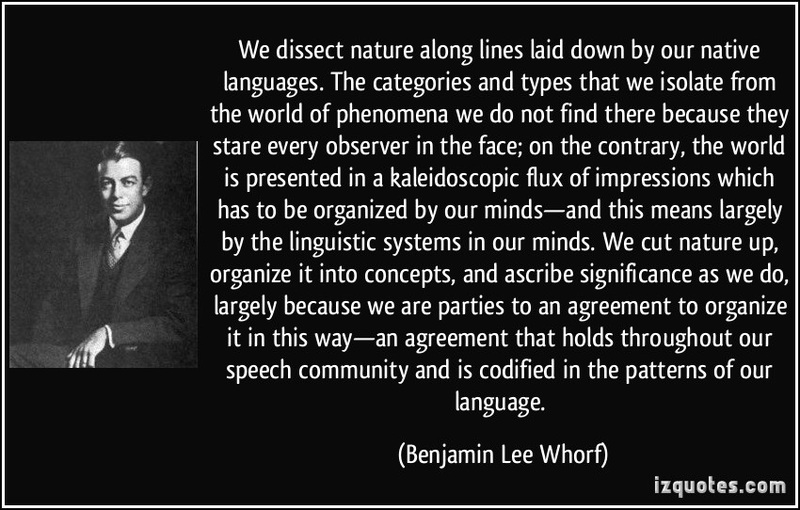 So one day I found myself sitting in a linguistics classroom, having just been introduced to the genius of Benjamin Lee Worf, a pillar of US language and thought. Worf developed what he called “Linguistic Relativity” which argued that one’s perception of the world is entirely mediated by one’s language. A northern European cannot comprehend the realities of an African Bushman anymore than a Tokyo businessman can truly know the ontology of an Anatolian shepherd. Makes sense to me. So much so, that I considered changing my major from psychology to linguistics. 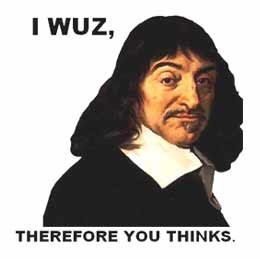 I considered the change for about 3 days until the Chair of UNM’s Linguistics Department finally convinced me that Worf’s theories had been roundly dismissed as bunk and his theories were no longer regarded as valid. Well, there was no way that I was going to pursue a career in a field where the leading lights were so misguided. By this time linguists were enamored with the “universalist” theory of Noam Chomsky and others, which argues that regardless of language, all humans are ready and able to understand the world in exactly the same way. Yet, as Native Americans know, time is circular rather than linear, and Worf is finally returning (though slowly) to a seat of prominence. I’m hoping that the other dim bulbs now holding down the linguistics fort will get out of their laboratories and into the field where they belong. Maybe some of them will head south into Latin America and face off against the world as defined by the subjunctive verb. I have recently had my own head-on collision with this other world. Yet as fascinating as the difference is, I am too under-qualified to be able to adequately perceive some of the subtler differences, so I’m asking for help. This posting is really an open letter to my sister-in-law Candice, married to my lovely younger brother. Candice is a true US of A hero: she’s a high school teacher. And for an impressive number of decades she’s led the heathens and the unwashed; your kids, and his kids, and her kids, and those kids over there (but not my kids, I don’t have any, HAH!) 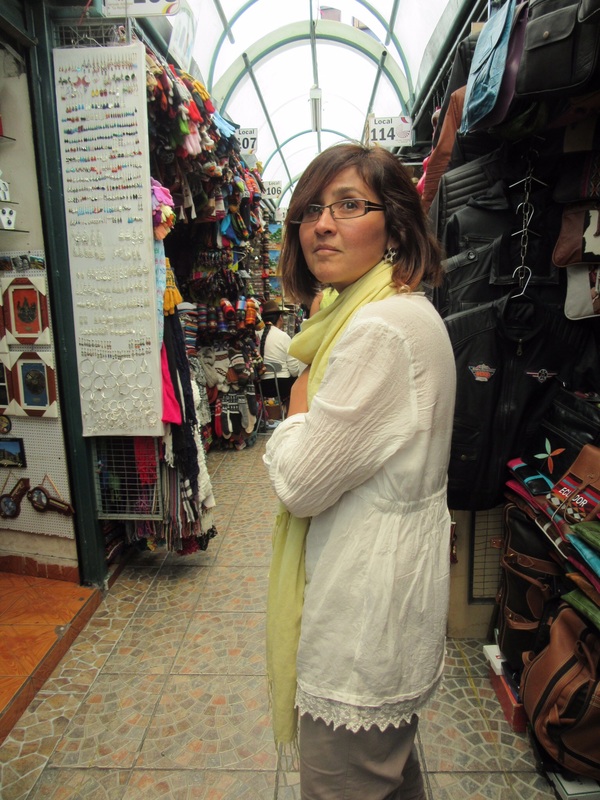 out of the darkness of monolingualism and into the amazing world of the Spanish language. As a teacher of Spanish she spends 9 months in the classroom and the other 3 months shepherding hoards of the little ruffians through Spain and/or a number of Latin American countries. If any of you think that public school teachers have 3 months of vacation every year, call her up and volunteer to help control adolescent hormones in a foreign clime. It ain’t a piece o’ cake. I’m writing this to Candice, but if anyone else has more than a ¿Donde está la biblioteca? understanding of the 3rd most frequently spoken world language, welcome aboard. Please throw your hat in the ring. Because I believe that, after more than 10 years of reading, writing, listening to, and speaking this language; why, I may have made some progress today. And I’m asking for clarification. Today’s Spanish class was great. It was an ¡AH, HAH! Moment that I had this afternoon. A Moment that rarely comes in one’s lifetime. And I’m not talking about those LSD-trippy days of the 60’s, when we all went ah hah. Back then we finally understood the universe, except when we came back down from the trip we saw it was just that the red flower was the only one in a bank of yellow ones. Good riddance fringed bell-bottoms. No this Moment today came about from re-acquainting myself with the subjunctive mode in Spanish verbs. 1 1. relating to or denoting a mood of verbs expressing what is imagined or wished or possible. 1 1. a verb in the subjunctive mood. Now that that’s cleared up, we know that subjunctive is an adjective, except when it isn’t. Or maybe it’s a noun, but then, what about verbs? I mean it might be, but then again who knows? Or really, for all us English-speakers: Who Cares? We have painfully few examples of the subjunctive in English. We have little direct knowledge of what is vital to more than half-a-billion Spanish speakers. Let me give you an embarrassing example. Or maybe it’s 2 examples, depending on how you look at it, or them. One of the fascinating websites that I used to get ready for my trip and still use to learn about culture in South America is Medellin Living. Three hours south of Honolulu I’d have been in the middle of the Pacific. But 3hrs south, non-stop, from Miami, I’d jubilantly deplane in Colombia’s trend-setting world class city of 2 million. A city that astounds new arrivals almost by the hour. If you still think that you’re being informed, truthfully I mean, by the likes of CNN or Fox “News,” or the other side of the same coin, MSNBC, or some other infotainment channel, then I’ve got a scoop: Pablo Escobar’s been dead for 30 years. Although interestingly enough, his hippopotami aren’t, but I’ll let you Google that one; they’ve become a very serious environmental issue. The point being that Colombia as a whole and Medellin in particular are worth a much closer look; and Colombians love yankees. I’d be a whole lot safer walking Colombian streets than those of my home town, Detroit. My original plan for this trip, a plan that still carries a modicum of truth, was to refine my language skills in Ecuador, Peru, and perhaps Bolivia, before landing in the north of South America. I may still make it. I’ve been planning to get to Medellin once I can (barely) understand the staccato rhythm of their rapid-fire brand of Spanish. Sooo, where’s the example of a subjunctive world? Medellin Living is primarily geared for a younger generation of hip and worldly mobile that won’t spurn a good time. Medellin Living, along with many other topics, tells you how to date Colombians. Thus, a frequent topic is that of addressing effective ways to break down cultural and gender non-specific, specific, and pan-specific barriers. In other words: how to party on the weekends and hold down a job, if need be, during the week. Or learn a language, or fly a kite. There are some serious local competitors for this last treat, so be warned, you warriors of the sky. Often 2 people, say for example: a gringo boy and a Latin American girl, will meet and seemingly hit it off very well, perhaps even seeing each other several times, with maybe (or not) a bit of intimacy involved. Nothing perhaps very exclusive as far as a relationship, but also not simply a casual, “Oh yeah, I remember, you were at the party too” kind of encounter either. Then the girl will suggest doing something fun together soon, and she will call the boy back to set it up. She will have specifics about where to go, what to wear, which songs to dance to, etc. She’ll have enough detail to let the boy know that this is really something she’s not just simply thought of, but really plans to do. So he waits. And he waits. And he waits for a call that never comes. This is such a common heartbreak that Medellin Living devoted an entire article to the unwary and vulnerable to serve warning of a pitfall as real as the pickpockets on public transportation. I first read about this some time back and also encountered corroborating accounts as well. Which allows one to suppose that I’d recognize a parallel behavior if it ever came my way. Yet I fell for it too; TWICE!! My first Spanish teacher and I spent a great deal of time together, 5 days per week for 5 weeks straight. We even met a few times after class when we shared a meal with her delightful husband. So when, during a taxi ride back to the school, she asked if I wanted to accompany the 2 of them to Otavalo in the northern mountains for a weekend of work, I said yes. Her husband, Edison, is a veterinarian who works for the federal government. Edison travels the whole country administering to wild animals in their natural habitats, even spending weeks at a time in the Galapagos Islands. He gets paid for the privilege of seeing what us gringo clowns pay $500/day to see. (Not this clown; 3 days of that kind of Galapagos luxury and my monthly budget would be shot.) So when his wife said that we’d be helping him tend to “A condor, or an eagle, or some kind of big bird,” I believed her. She said she’d call and she was my teacher, so of course she’d call, right? That call never came and she never mentioned it again. Fast forward 2 months. Raquell’s gone off to a different school (Spanish teachers here are hired guns. They work as independent contractors and are always hustling for work in a highly competitive field.). I’ve come and gone to Cuenca, fully immersed myself with another teacher and everyone tells me that my Spanish is really accelerating. Last week, walking home in the rain, who do I see but Raquell. She goes all Ecuadorian on me with the kissy-kissy on the right cheek several times. That is the standard greeting here in the middle of the earth, and you better remember that it’s the right cheek or else you’re in for a painful close-encounter. When she’s finished with the greetings and a soulful thank you for the parting gift I gave to her and her family, she asks what I’m doing in 2 weeks? It’s not like my social calendar is overloaded, so I guessed that I could probably be available, why? Well she and her husband are going to Esmeralda, the home of Afro-Ecuadorian culture on the northwest coast. And she wants me to come with them for the weekend. Edison has to work with yet another ill-defined animal, needs help, and would I join them? Willing to prove that suckers really are born every minute, I naturally said yes. And then went home and got ready to pack. And, yes of course, wait for the call. The weekend of note has come and gone, and I finally stopped waiting. So while you’re winding up for a culture-wide condemnation of the Spanish-speaking world, let me stop that silliness before it leaves the box. In general, and particularly in the sierra (the mountainous regions of South America) the cultural norms are ones of refinement and respect wrapped heavily in courtesy. Which to our North American eyes seems impossibly contradictory to this other, set-me-up behavior. How could someone who knows that she will probably run into me again before I leave in 6 months, lie to me so boldly? Unless it’s not a lie? Unless, and this is where I need some context, it would only be a lie if the person posing the invitation didn’t want it to happen in some dreamy far-off world where wishes can come true? This truly wondrous book from Marquez follows a family of note through 100 years of its life, running forwards and back in time, playing with linearity like a rubber ball. The common tie across generations is the ghost of the grandfather showing up again and again offering sage advice and codging a drink of booze or 2. And the idea of what is real and what is imagined, what exists and what defines existence, and if the mind wants something to be real, who are we to deny that it isn’t, is central to not only Magical Realism, but I think to the core of Latin American thought. I do not believe that Raquell set me up any more than the heavy breathers in Medellin were set up by the Colombianas. What I do think is that with 14 verb tenses in the Spanish language, and half of those tenses in the subjunctive mode, Benjamin Worf is still right on the money. We are, as a species, held captive by the words we use and they way we use them. OK class, the grammar lesson is over for today. Your homework consists of reading a book, watching a movie, or writing in the subjunctive mode about what could just be real. Or not. This entry was posted in Uncategorized and tagged Benjamin Lee Worf, Linguistics, Magical Realism, Spanish language, Subjunctive on 2015-04-11 by kmalivuk. Delightful. I had the same issue in trying to learn Koina (New Testament) Greek. The passive voice was fun too and the instructor had us diagram the sentences. Made a little more sense then but we didn’t have to have conversations with it. The more leisure academic analysis made it possible for me. So I admire the efforts of an old guy like you…younger bro. Wow! I forgot about diagraming sentences. That would certainly be a great help in general. Spanish has both direct and indirect object pronouns, layered with both polite and familiar ways of addressing people. Diagraming these could well tease out just what is going on in some of the more complex sentences. I’m often wondering just who did what to whom, or was it which? And then, if they sneak a subjunctive verb in there when I’m not watching, the whole exercise becomes a speculative rats nest. But I gotta say, it’s a blast! piggybacking since I can’t find the regular reply button…. Kinda confused. Did she make these invitations subjunctively? that is, would you have known she didn’t mean for you to take it seriously if your Spanish was more refined? That’s the interesting part of this equation: she made the invitations in English! Which really complicates things since there are multiple layers of confusion. Since she made both of the invitations in English, but she natively thinks in the subjunctive, who did what to whom not only where but when? Curiouser and more curiouser. Think I’ll wait for my second encounter with this concept and try to wrap my head around it then. Now that you’ve told us she was speaking English trying to understand this has literally made me dizzy. Gotta go lie down. I find it interesting that the subjunctive is also used for commands. use of the subjunctive for commands. outcome recognized formally in the language. selling novels. As a culture then, if our language directs us to be mainly concerned with activity and not pensivity, what are we missing out on? What aspect of life have we lost? OK, I changed it. I’m not sure what you see when you post a comment, and if you can edit your words after you post. In any case I replaced what you first had for those 2 sentences. I also noticed that present subjunctive and imperative are conjugated the same, but haven’t talked to my teacher about the similarities. She’s preparing an exam for me to take at some point this week. I think that maybe I will have another teacher when I return from down south. Since I’ll be out of town for 18 days, the teacher will have to find another job. Her husband’s a lawyer but has no regular salary so she’s the major breadwinner, with a daughter and grand-daughter also living at home. Chispas! After reading all this, I realize that we (Karl and Cindy and I) haven’t spent nearly enough time discussing all this stuff! After spending an entire adult lifetime searching, researching and trying to communicate the differences between both language as well as simple thought, I have finally found someone who not only dares to ponder this but also seems to enjoy the tedious exercise!! We have really enjoyed all your journeys (with intense jealousy!!) but this last entry was simply exhilarating to me! It has touched on the most basic understanding that culture must be studied through language and vice versa! And that is the only way– your way– of experiencing this fascinating world of Latin America. For that reason, I am certain your Spanish is now perfected! There are so many more conversations I would like to have with you. My students will be so happy to hear I have found someone else to share these topics with so they won’t have to be subjected to my weird explanations and certainly unfounded enthusiasm for what makes absolutely no sense to them! I can’t tell you how much your kind words of appreciation/recognition mean to me (and all Spanish teachers)! Thank you! I could go on for hours, but unfortunately my subjunctive world is being rudely disrupted by my indicative world of grading exams and making exciting lesson plans and no amount of Magical Realism is going to help escape! Your writing is amazing, Karl. It should be published!! Candice please forgive me! I kept thinking that I was spelling your name correctly, but all along I have been butchering it. I deeply apologize and will edit my entry. But not before thanking you and saying YES! The subjunctive lives and once it struck me at how deeply it lives here in Latin America, I am even more excited to “andandandoypensando” through this marvelous place. As far as “perfected” embarrassingly, no, but I have reached the point where I am more often that not holding up my end of the conversation. As for Cindy’s entry: I’m over my head there in positing a view on the connection between subjunctive and imperative. HELP! I certainly don’t have anything to add to this lofty and abstract discussion (uh, what’s for dinner?) but thought it would be tangent to add that students from the school where I taught no longer diagram sentences – nor do they write in or understand cursive or interpret time from analog clock faces. As you can see, my command of verb tenses in English is sadly lacking so to sally forth on the subjunctive…..wait, that’s an eye-infection is it not? Maybe I’m not so dumb! To be honest, my classes seemed to have escaped diagramming too, while other classes around me were doing so. Joann Lynch seemed to think that her students were above that sort of thing, yet I always wanted to do so. As far as dinner? Not a lot, the big meal here is mid-day. I had been mistakenly referring to the evening meal as “cena” but Carmen, the mother of the house, says that cena is far too formal. What we do instead is “merendar” but the food is still great.